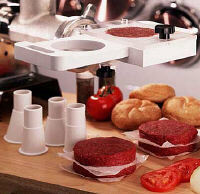 No more messy work when making patties. The Weston Rapid Patty Chopper Attachment is great for wild game or domestic meats. It produces perfect patties each time, quickly and easily! Attaches easily to most electric or manual choppers & sausage stuffers. Quick and easy cleanup. This is a household must for patty makers. Comes with 5 adapter funnels to adapt to most Choppers: 2-1/8" , 2-5/8" , 2-7/8" , 3-5/8" 4-1/2"
Dimensions: 14-1/4" x 8-1/4" x 4-3/4"